That I’ve been playing the syncopated backbone of this song all weekend from a newly purchased sheet music book is all the proof in the world that cover art can make a difference in selling a record. I was forever hearing A Fine Frenzy’s name on the wind, but never a song. I assumed she was one of the bevy of artists sampled by Grey’s Anatomy or similar. I gave her a rote 30-second preview, and that combined with the little girl image on the cover of her One Cell In the Sea promised a pleasant-but-simpering cross between Ingrid Michaelson and Regina Spektor. Since I can barely get through an entire treacly disc from either without heaving up my most recent meal, I decided to take a pass. When I spotted the cover of Frenzy’s followup, A Bomb in a Birdcage, I was intrigued. I recognized the name, but the black and white cover image looked more sultry than sugary. “Electric Twist” is a five-star song. Its circular stutter of power chords are fuzzy and rich like fudge, while artist Alison Sudol’s voice goes from kittenish whisper to impossibly pure high coo. The primal, hip-thrusting rhythm eventually gives way to a satisfying sprint of straight-forward dance rock on the 1s and 3s. “Electric Twist” was my doorway into Bomb in a Birdcage, a fantastic album that’s strong from front to back. Even E adopted it into her daily playlists, a sure sign of a deep disc with some obvious delights. Maybe you think it should be “don’t judge an LP by it’s cover,” but that’s the whole point of selling an aural experience with a visual one. Album titles and cover images are what get consumers to sample sounds – it was true fifty years ago in a record shop and it’s true today on the internet. I’d say the moral is: keep the promise your cover makes, and make it a good one. The best album covers are like a perfect still frame from a mega-mix music video of your album. 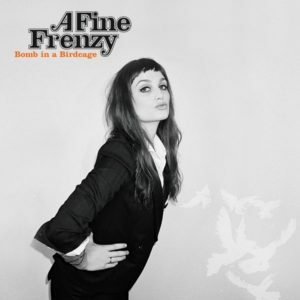 Case and point: I’m pretty sure A Fine Frenzy is doing the electric twist on that cover. Oh wow. That song is awesome. Totally buying their album now.